Thrive Leads Review 2019: This Is A List Building Plugin On Steroids! Are you serious about growing your email list? 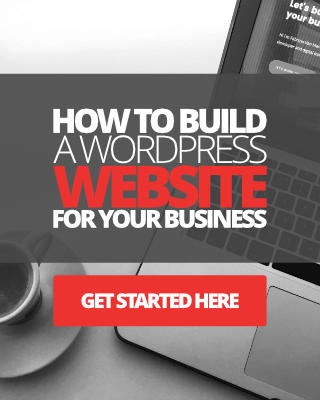 Well, in this post, you're going to learn about what is possibly the best list building WordPress plugin available to help you get the job done. If you’re a frequent reader or subscriber of my blog, you may recall that I wrote an in-depth strategy post about how I was able to skyrocket my email list growth by almost 400%, using good old fashioned bribery (incentivised email marketing). If you missed that post and would like to read it later, then you can check it out here. 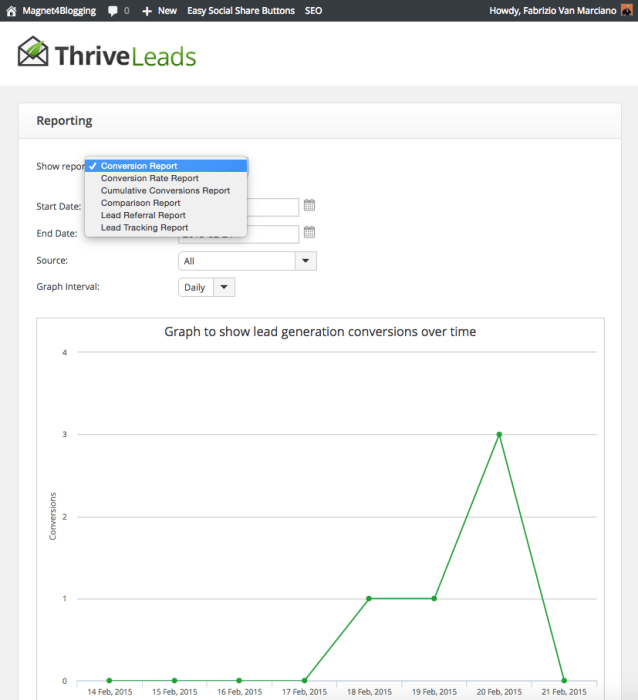 Anyhow, one of my all-time favourite WordPress plugin's is a tool called Thrive Leads. You may have heard about it already as it has become one of the most popular list building plugins for WordPress. Thrive Leads has turned out to be one of the smartest tools I've invested for the growth of my online business. Reminder - If this is your first time on my blog, a warm welcome to you. I want you to know the purpose of my online reviews is for me to share with you the tools I am using to grow my online business. After which, you can make up your own mind whether anything I have reviewed or recommended on this site is worth your time and money, or not. I never review anything that I have not tried, tested or not used in my business, and I never review anything that I have not fully paid for myself. If you would like to read my affiliate disclaimer, please scroll to the end of this page. So what is this Thrive Leads all about? Thrive Leads is an all-in-one opt-in form builder and email list building plugin for WordPress. 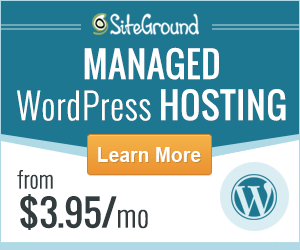 It works with any WordPress hosted website, not WordPress.com websites. There are thousands of various plugins out there to use for your WordPress website, however, very few are actually designed to make a real significant difference, or to deliver exactly what it promises to. 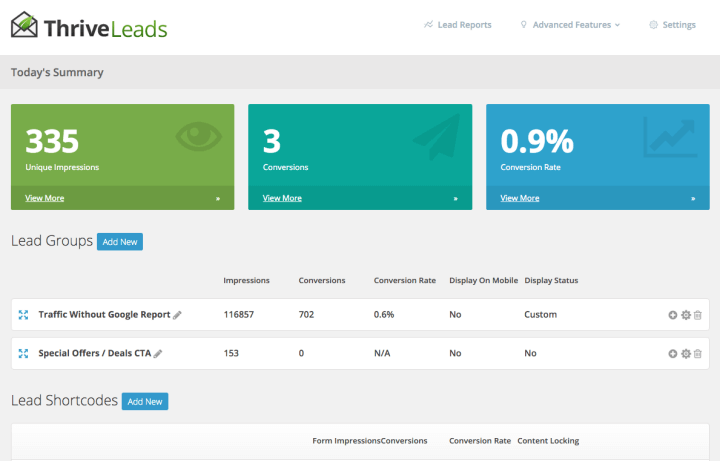 Thrive Leads, in my opinion, is one of the best WordPress conversions plugins ever created! When it comes to list building plugins, there's nothing else out there quite like Thrive Leads. 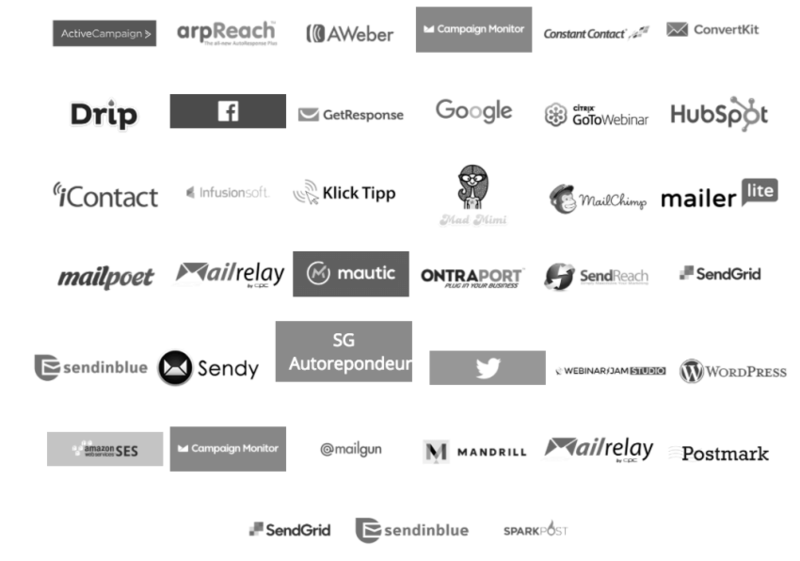 Sure, there are plenty of other tools and plugins for you to choose from out there, but very few offer the level of conversion optimization options and features as Thrive Leads. Check out my comparison post of Thrive Leads and Opt-in Monster here. When it comes to saving time, energy, resources, and your sanity - Thrive Leads ticks all of the boxes in my opinion. As bloggers and entrepreneurs, we simply don't have the time to waste learning how to set up critical infrastructures on our websites. From installing, activating, selecting and using a pre-designed opt-in form template - to setting up your email marketing service provider, and tracking conversions - it's all super fast and simple with Thrive Leads. I have been using Thrive Leads on this website, and many client website projects since 2015, and will continue to do so for many years to come. So, how does it work and what are the benefits? Thrive Leads was designed to help online businesses, marketers, and bloggers create, customize, and brand professional looking, conversion focused email opt-in forms for their WordPress websites, quickly, and that’s just the start of it. Like I said at the start, there are many other tools, plugins, and options for you to consider using other than Thrive Leads. In fact, there's LeadPages, Opt-in Skin, and OptinMonster. These are just a few of them, however, Thrive Leads takes the game to another level entirely, and it does this by saving you time as I mentioned above. Now, how exactly does Thrive Leads save you time? Well, for starters, Thrive Leads comes with a nice library of pre-designed, conversion-optimized forms that you can instantly drop and begin using to grow your email list quickly. You're not wasting valuable time designing forms from complete scratch, however, you do have that option. The plugin takes elements from the old Hybrid Connect list building plugin, if you can remember that one at all. And it combines the new technology with the customizability power of the awesome Thrive Architect plugin. 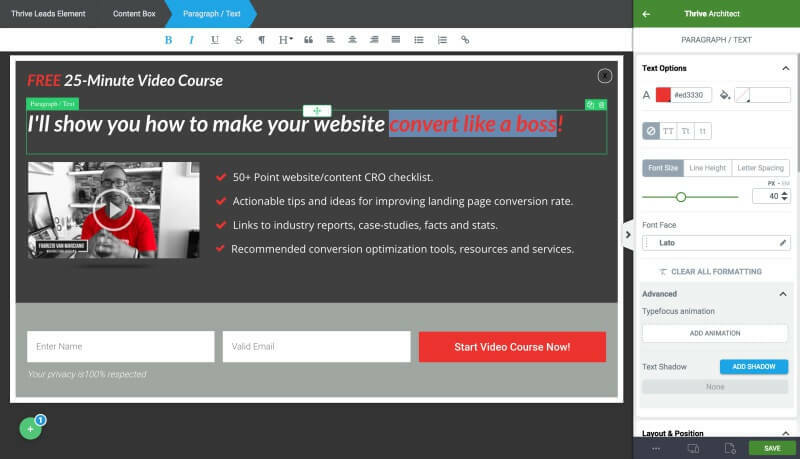 The result is a powerful opt-in form list building tool like nothing else, complete with built-in canvas, metrics, AB split-testing tools, conversion and content marketing reporting tools, and a whole lot more. Do you value your time, money, and sanity? Are you looking for a list building plugin that comes with extensive online tutorials, guidance, support? Are you serious about growing your business and conversion optimization? Now, tell me about the features and options in Thrive Leads? I originally wrote this review way back in 2015. It's now almost 2019 and a lot has changed since then. One of the things I love about Thrive Themes, as a digital company is that they’re always improving their product range. They legitimately care about their customers. The updates, new features, and upgrades I've seen in Thrive Leads over the years has been phenomenal, and that one of the other reasons I enjoy using this plugin. #1. 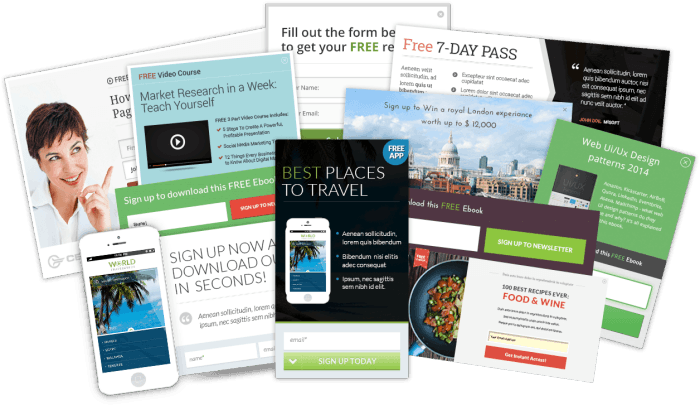 Design and publish like a pro – Thrive Leads contains all the email opt-in form templates you could ever need to get started with your list building efforts. In addition, these templates can be fully customized further, using the same point, drag-and-drop editing technology found in the Thrive Architect plugin. You can create and design professional and branded opt-in forms with absolutely no limitation and place them almost anywhere on your WordPress site. We'll talk more about opt-in form placement later on. 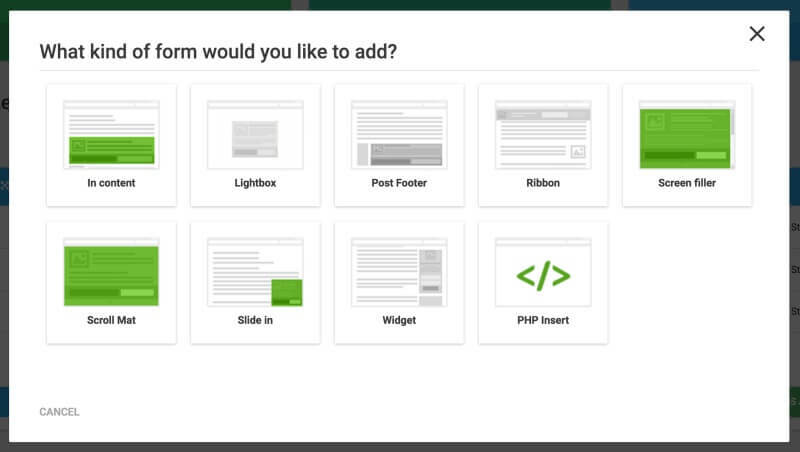 No coding experience is required to design or customize your forms! #2. Advanced targeting – This is a truly powerful feature within Thrive Leads and one that makes this plugin different from all the rest. You can boost your email opt-in conversions quite dramatically, simply by displaying targeted opt-in offers for your blog or website visitors. This can be based on the type of blog posts, pages, categories, tags and more. So, for my website, for instance, I have targeted opt-in forms created for several specific cornerstone articles. #3. AB testing engine – No list building plugin is complete without AB testing tools. Thrive Leads enables you to create lead groups. In addition to this, you can also create multiple versions of a form within a group so that you can perform simple A/B split testing. This is hugely important and beneficial for optimizing forms and increasing your conversion rates. And, if you’re obsessed with doing split testing, like I am, you’re going to love this feature so much. See the images below. Images above: Overview of the performance of one of my conversion forms. You can create as many forms as you want and perform A/B testing to see which form converts the best. Additionally, you can edit, clone, reset stats and archive your forms too. #4. Multiple choice Opt-in Forms – Thrive Leads comes with multi-step and multiple choice form features. This means you can create a pop-up form that presents a Yes/No choice, with each choice leading to a different offer or call-to-action. #5. SmartLinks Feature – SmartLinks allows you to create multi-states for none-subscribers and already subscribed users. This simply means you don't have to keep showing the same opt-in forms to those who have already subscribed to your website or blog. Instead, you can create custom content for existing subscribers to see. Awesome stuff, right? #6. 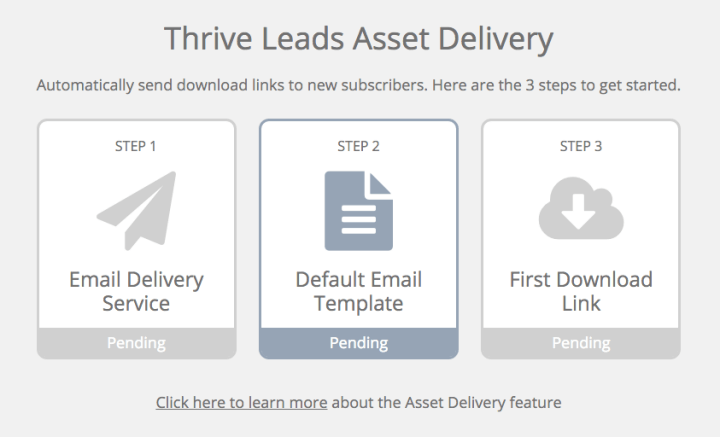 Asset Delivery Feature – The built-in asset delivery feature allows you to send download links to new subscribers. 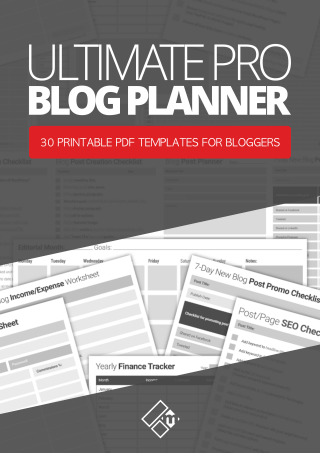 This feature is really useful for bloggers and businesses looking to create targeted content upgrades for their readers. It really takes away the hassle and work-around chores of having to create new lists inside of your email marketing service provider. See image below. #7. Reporting and insights tools – The metrics tools gives you an overview of how your opt-in forms are performing for each lead group. Over time, you can actually use this information to fine tune your list building strategies by seeing exactly where your most valuable traffic is coming from. Image above: Create groups of forms and test the types of forms against each other, you can further edit these forms using the content editor, and use advanced targeting tools. Above: Generate accurate reports for specific time periods, view graph intervals for a day, week or month. One single plugin, multiple ways to generate MORE leads! How versatile is Thrive Leads? Delete them all and use ONLY Thrive Leads instead. Everything you'll ever need is built right in. 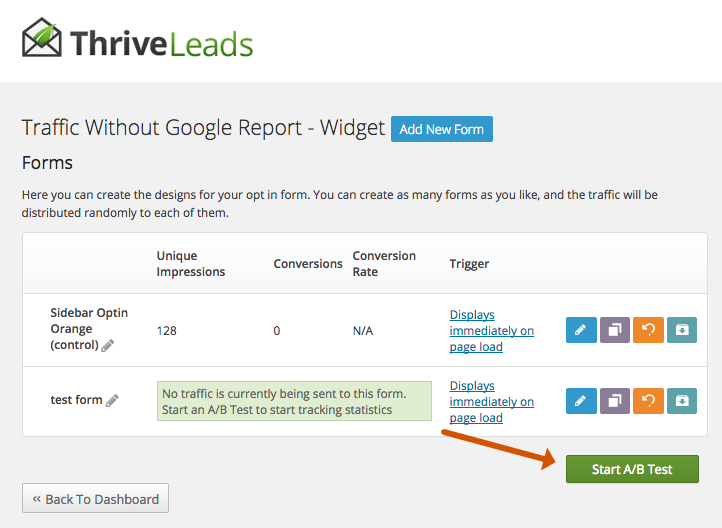 Here are the types of lead forms you can create using Thrive Leads. And just to remind you again that these forms can be edited, branded, and fully customized with your preferences. Sticky ribbon forms (Top or bottom of page). Slide-in (Slides in at the bottom of the page). Screen-filler lightbox (Takes up entire screen). Scroll Mat (Appears first on a page and disappears as your users scroll down). Yes or No multiple choice forms. A wide range of pre-design form templates to choose from, plus each of these can be customised further. Or build your own form completely from scratch! Each form in within Thrive Leads come with their own unique settings, giving you complete control over how each form behaves on your website. For instance, you might want to adjust the trigger setting, display frequency or animation on your screen-filler light-box form. Or, you might want to turn on SmartExit+ (an exit-intent feature that triggers your opt-in form to appear whenever a visitor attempts to exit your site, page or blog post, or close the tab). See images below. Now. The important bits, email integration! I use and have always used MailChimp, so for me personally, configuring Thrive Leads with MailChimp is so simple to do. 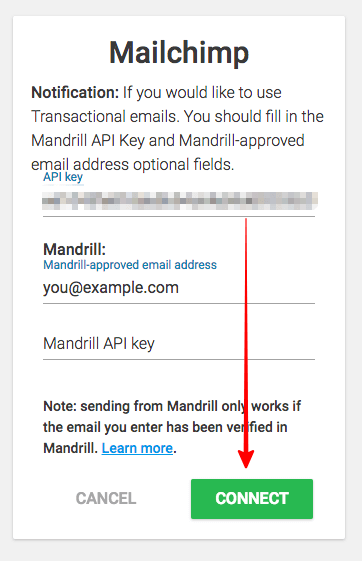 Recommended tutorial: Click here to learn how to integrate and configure API connection with your MailChimp account. And in all honesty, it doesn't matter who you are using for your email marketing, chances are you can configure it with Thrive Leads. I would strongly recommend integrating API connection as it gives you better control and more options for your forms. OK, so hopefully by now you're convinced that Thrive Leads would be a great investment for the growth of your online business. Let's take a look at the current pricing options. Each license pack gives you access to all the Thrive Leads features, unlimited free updates, and 1 full year of support. Thrive Themes Membership offers the best value for money in my opinion. Being a member doesn't just give you access to Thrive Leads, but all of the Thrive conversion marketing products, themes, and plugins currently available. You can check out my Thrive Themes Membership review post here. So, what pros and cons come with using Thrive Leads then? Affordable when compared to other plugins or services. Easy to use with simple drag-and-drop editing, no coding required. Huge library of editable templates. Advanced targeting tools built right in! 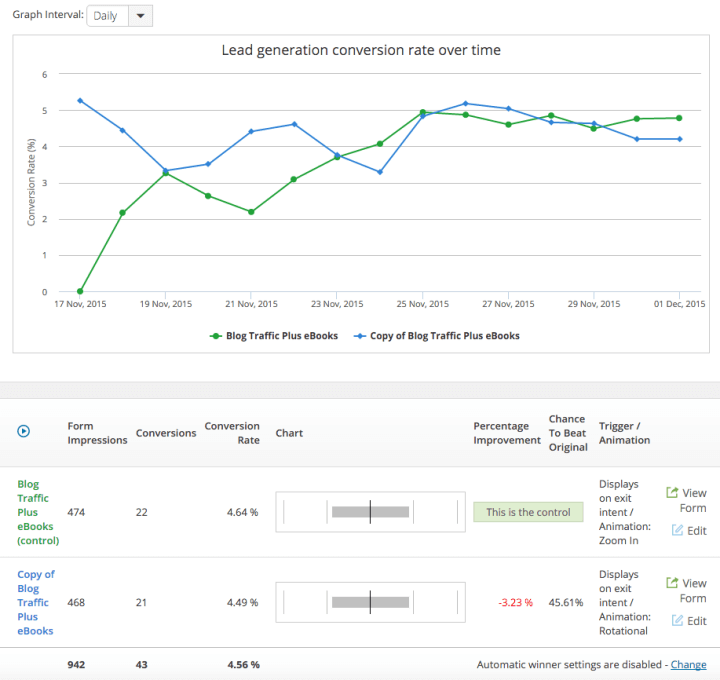 Powerful metrics and conversion reporting tools. Forms are fully mobile-responsive, with option to turn-off mobile sites. Cross browser tested and compatible. Advanced options for adding multiple fields, checkboxes, radio buttons, drop-down menus to your forms. 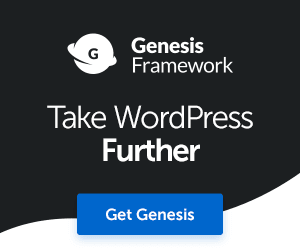 Only available for self-hosted WordPress sites (Not WordPress.com websites). No options for building email opt-in landing pages, however, this feature is available in Thrive Architect. I think you know what my conclusion is regarding Thrive Leads. Thrive Themes never fail when it comes to providing us with products that are truly awesome and useful for growing our online businesses and increasing conversions. "wow, that was one of the best decisions I've ever made." That's exactly how I feel about Thrive Leads today (2019), 4 years after investing in the plugin, which is why I highly recommend it. Which ever tool you decide to use, I want to wish you the best of luck with your email list building efforts. Affiliate Disclaimer: This post may contain affiliate links to products or services that I use in my business and therefore recommend. This means if you click on an affiliate link and make a purchase of a product or service, I may earn a small commission, at no additional cost to you. Thank you for your continued support. So I wanted to read about this and thank you for sharing this by the way. 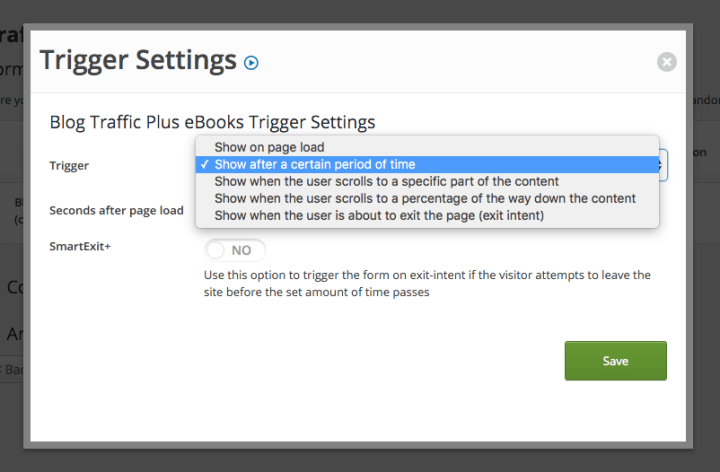 I went in search some time ago for a plugin to help me with my opt-in boxes and I tested out Hybrid Connect and OptInMonster. What I was after was an opt-in box to put mainly at the end of my posts. I wasn’t necessarily looking for yet another opt-in box though, I was going to create an image and when they clicked on that it would take them to a pop-up opt-in box to sign up for my list. My problem was that I like to ask for the name, email & phone number. Hybrid Connect doesn’t allow you to add those and OptInMonster’s was a nightmare. Support really tried to help me but it just never worked. I’m still searching so will this plugin do that do you know? I don’t mind buying it and testing it out but if I know up front it won’t then I won’t waste anyone’s time. I would like to create my own opt-in boxes though and have them a lot more attractive. I like the metrics they provide as well. Okay, enough about all of that and I’ll check back to see if you’ve responded. Thanks Fabrizio for your honest review and I’m excited about the direction you’re headed. Anyway, to address your question, that really depends on who you use as your email service provider. The Thrive Leads plugin will configure any provider as long as you can create HTML forms in your email provider. I use MailChimp and all I had to do to add a phone number was to create a new field in my list, regenerate the HTML, embed it into my Thrive form and hey presto. If you look at the footer opt-in form above now, it has a new field for telephone. I’ve done this to show you. When you reply to this comment I’ll remove the field. Thanks for the response, I appreciate it. The other question I had was if I have them click on an image can I get a small pop-up box to appear in order for them to opt-in? Just trying new things on my blog so this was something I’ve really wanted to use. Right now I have a landing page they go to but I prefer them staying on my blog while going through this process. Thanks again Fabrizio for helping me with this. I’m started to get excited again.